This classic French recipe for Pear Frangipane Tart is the perfect use for fall pears. Use a 10" tart pan with a removable bottom for this wonderful and delicious recipe. I like using a Nut Cookie Pie Crust using chopped almonds. Yum! You do need to use a tart pan with a removable bottom for this recipe. This pan is wider and shallower than a typical pie pan and shows off the pears beautifully. Be careful when handling this type of pan. Even with a pie crust pressed into it, the sides can slip off the bottom. I have ruined a pie by not being careful! Hold the pan by the sides, never by the bottom. The pears you choose for this recipe should be firm but ripe. They should yield gently to pressure, but should not have any soft spots or bruises. Pears do turn brown quickly after they have been peeled and cut, so work fast. You can brush them with lemon juice as you work if you aren't a fast worker. I like Bosc pears since they seem to have more flavor. This beautiful tart can be served warm or cool. It's delicious topped with whipped cream, softly whipped with a bit of powdered sugar and vanilla or pear liqueur. Serve it after a hearty meal of roast chicken served with scalloped potatoes and a green salad. Prepare tart shell, using Hot Water Pastry recipe, or the Nut Cookie Pie Crust and set aside. In a food processor, crumble the almond paste and add powdered sugar and butter; process until mixed and smooth. Add eggs, cover, and process again until smooth. Pour the almond mixture into the prepared tart shell. Now prepare the pears; peel, core, and slice them into 1/2" slices. Arrange the pear slices over the almond filling on their sides, making a circular pattern, pressing into the almond mixture slightly. Sprinkle the pears with the lemon juice, then with the sugar. 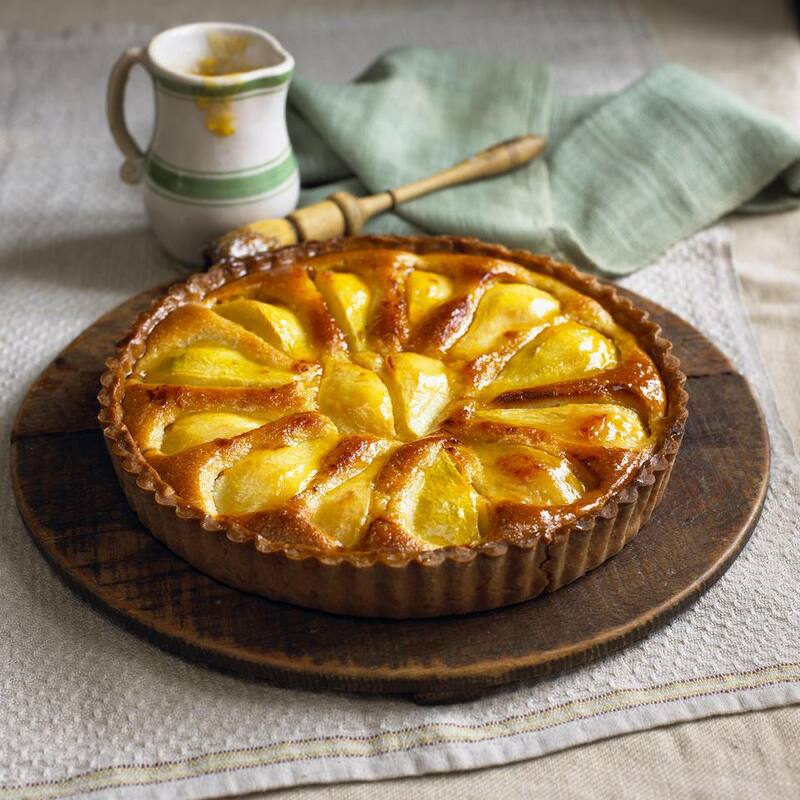 Bake the tart for 40-50 minutes or until almond filling is set and the pears are light brown and glazed. Remove the tart from the oven and place it on a wire rack. In a small saucepan, heat the jelly until liquid and smooth, stirring frequently; carefully brush over the pears. Let the tart cool, then serve.